« Movie Review: Can You Ever Forgive Me? Bohemian Rhapsody is a biopic of Freddie Mercury (Rami Malek), the iconic lead singer of the British rock band Queen. It starts with the early life of Freddie, whose birth name was Farrokh Bulsara, was born in Zanzibar, and grew up there and in India before moving to England with this family. He is widely regarded as one of the best singers in rock history with a vocal range of four octaves. Freddie broke through stereotypes and conquered convention when he lead the band Queen through a meteoric rise in the 1980s. Freddie’s lifestyle almost ruined the band. They reunited just before the Live Aid concert in 1985. Their performance at that concert is widely regarded as the greatest rock performance of all time. The movie was criticized for flattening out the Freddie Mercury character, but I don’t know how you could give it any more depth in a movie. Yes, to the music critics and people studying the persona of the famed singer, no movie can ever do it justice. 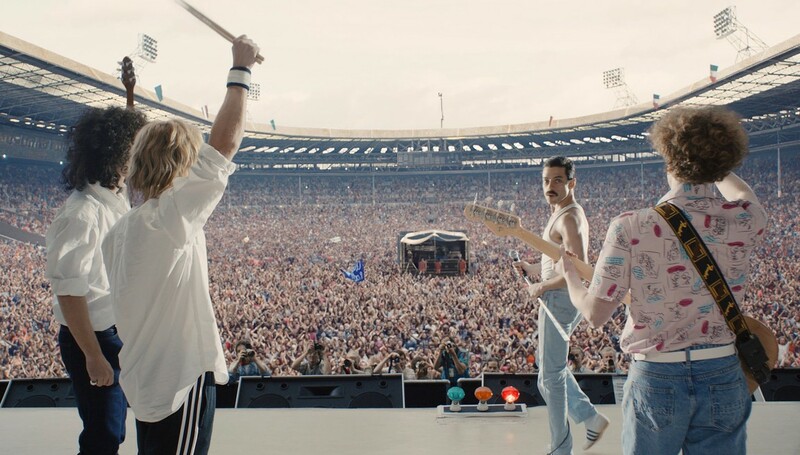 But for the average person, like me, who really wasn’t that into any specific band, Bohemian Rhapsody has prompted me to study up on Queen, read more about Freddie, and relive some of those iconic moments in rock history. Rami Malek did an amazing job playing Freddie. He warned the producers that he is not a singer. The soundtrack is original Queen, and the voice of Freddie. The New York Times also reported that Rami’s voice is mixed in with Marc Matel, a Canadian singer who is known as one of the best Freddie soundalikes. I was rocking, I was reminiscing, and I was thoroughly enjoying the Bohemian Rhapsody. It’s a killer soundtrack. For years, John and I had a cassette of Queen in the car and would play “Barcelona” at top volume every trip we took. Thrilled us to pieces! 😀 Better than a cup of strong coffee. I’d never heard Barcelona, just did! Thanks for the hint. Yep. That would have added more time – that’s probably why they kept it out. I thoroughly enjoyed the movie, too, Norbert. And I thought Malek did a great job portraying Freddie. Hi Vera – thanks for your input. It’s funny how we can both have the same experience on other sides of the globe nowadays. It’s such a neat feeling. I value your input. It’s always been very keen and insightful. Yes, isn’t it — a wonderful feeling! Thanks, Norbert.